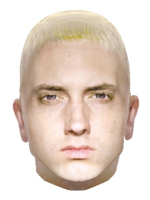 We are bringing Eminem to you the way that nobody else ever did before ;) Seriously though, this is just a test "project" and I figured I'd share the results with you. More animated virtual characters and 3D models might be uploaded in the future. NOTE: You will be asked to download a plugin which is needed to display 3D models. You need to use Internet Explorer or else you won't be able to see it. Once you do, right click on the 3D model and press play.